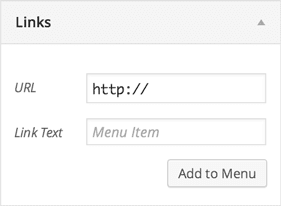 WordPress has great support for editing navigation menus. Just login and go to Appearance > Menus in the left navigation. This system, depending upon your theme, allows you to control nearly any menu on the site, even create new ones that can be placed throughout your site via the Widgets area. It’s not always clear, though, how to create links to external websites (ie, not your own site, but another one). Even trickier is getting them to open those specific links in a new tab or window (ie, target="_blank"). In the Menu Screen (Appearance > Menus), look in the left column that typically lists Pages, Posts, Categories, etc. Find the Links box and click the arrow beside it to open it up. 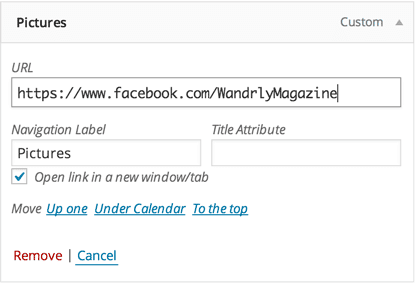 In the URL field, enter in the complete link where you want to send people. Example: http://google.com. Then give the item a name in Link Text. This is what users will see on the front end of your site. Next, click the Screen Options tab up near the top right of the page. Choose Link Target from the various checkboxes that show up there. This will give us additional options to open the link in a new window. Over on the right, where the various menu items are listed out, you should see something like the image below. Tick the checkbox to make this link open in a new window or tab. Click Save Menu and you’re all set! Its easy to open links in new tabs but I cant seem to get them to open within the wordpress site. I dont want to the link in a new tab but rather open like any other wordpress page on my site… with the menus and sidebars in place. I do not tick the “Open in new tab” box but yet it still opens in a new tab when I click the link. Strange, Mario, as that’s the default behavior. Sounds like your theme is doing something to force links to open in a new window / tab.